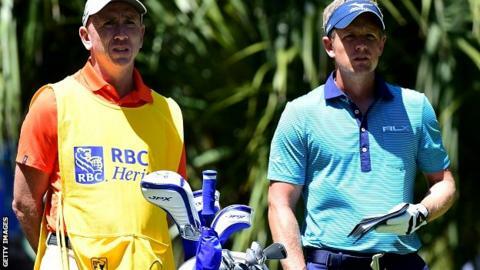 Luke Donald will head into the final round of the RBC Heritage one stroke clear of the field after regaining the lead on day three at Hilton Head. The Englishman, who led after round one, shot a two-under 69 to move to seven under par, one clear of Americans Jason Kokrak and Charley Kaufmann. Scotland's Russell Knox slipped back to three under with a round of 73. World number one Jason Day had a disastrous day, making eight bogeys and one double bogey in a 79. That left the Australian tied for 40th place overall on two over par in South Carolina. Donald, 38, is without a PGA or European Tour win since 2012, has slipped to 95 in the world rankings and considered retirement last year. But he revealed watching from home while fellow Englishman Danny Willett won the Masters last week was a motivating experience. "I certainly don't want to be sitting on the couch watching people win majors, especially your fellow countryman, guys I played with," he told pgatour.com. "Danny obviously played great but I certainly feel I have some good years in me and I'm not quite ready to resign to the couch just yet." Looking ahead to the final round, Donald added: "I think conditions are meant to be a little calmer, a little bit less wind. "I need to go out there and play a round like I did today, not play defensive, try and make some birdies and hopefully shoot three or four under and hopefully that will be enough."